Whole coriander seeds are roasted in a pan till aromatic. Chana dal and spices are also roasted and ground into fine powder along with coriander seeds. The powder is then stored tight in a jar and can be served with idly, dosa etc or with steamed rice and dollop of ghee. Makes: around 1/2 Cup of Spicy Coriander Powder. Break the dried red chiles into pieces. Heat oil in a heavy bottomed pan on low flame, add garlic cloves, coriander seeds, chana dal, cumin seeds and whole red chiles and fry till aromatic or until chana dal is light golden brown in color. Cool all the roasted ingredients to room temperature. Grind the roasted ingredients into powder along with sufficient salt. 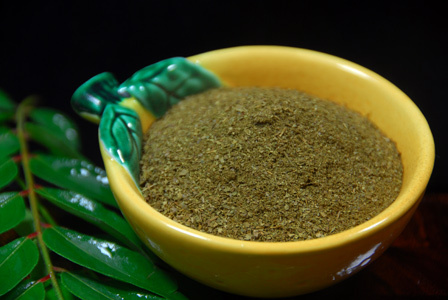 Store in a dry place and this coriander seeds powder stays fresh for couple of months. Serve spicy coriander powder with idly, dosa or plain steamed rice and dollop of ghee. Suggestions: Adjust spice with red chili. Variations: Check other spice powders here. Other Names: Spicy Coriander Powder, Dhaniyala Karam. Raw peanuts are roasted till light golden color. Red chiles, cumin seeds are fried till aromatic. All the ingredients are then ground into fine powder with tamarind and jaggery using a spice grinder. The resulting peanuts powder is then stored tight in a jar and used when necessary. 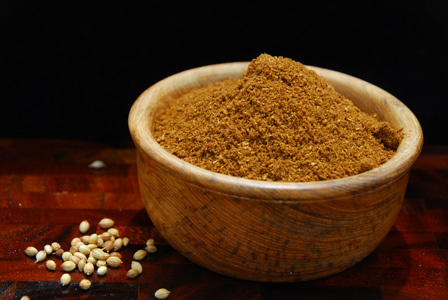 Makes: around 1 1/2 Cups of Spicy Peanuts Powder. Heat a heavy bottomed pan on medium heat, add peanuts. Stir continuously and roast them till the peanuts turn light golden color (around 5 minutes). Remove the peanuts onto a wide plate to let them cool to room temperature. Heat oil in the same pan, add broken red chiles, cumin seeds and ginger. Fry for couple of seconds till cumin seeds change color and red chiles are crisp. Remove from heat, add tamarind, curry leaves to warm pan and cool it down. Grind peanuts, red chillies, cumin seeds, garlic, jaggery, tamarind, curry leaves into fine powder along with sufficient salt. Store the ground peanuts powder tight in a jar and use when necessary for couple of months. 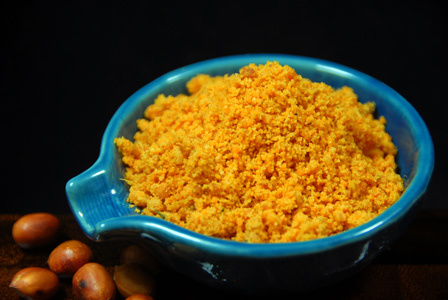 Serve spicy peanuts powder with plain steamed rice or with steamed idly and with a dollop of ghee. Notes: Make sure not to burn the peanuts while roasting. Suggestions: If peanut powder is not spicy enough, adjust the amount of dried red chiles to your preference. Other Names: Spicy Peanut Powder, Pallila Podi. Makes: around a Cup of Garlic Spice Mixture. Heat oil in a pan, add garlic cloves and fry on low flame till they turn golden in color and remove from heat. Add the tamarind to the warm pan and keep aside. Heat a heavy bottomed pan on low heat, fry urad dal , chana dal and cumin seeds separately until golden in color or until aromatic. Add a few drops of oil to the pan and add the broken red chiles and toast them until the red chiles are crisp. Cool the roasted ingredients to room temperature and grind them into powder. Stir in fried garlic cloves, tamarind and salt and pulse a couple of times into coarse mixture. 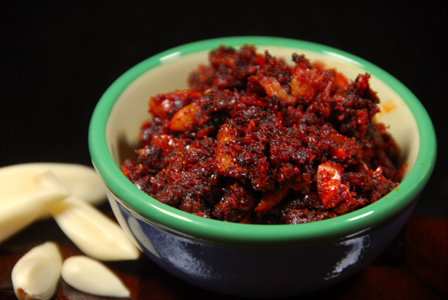 Suggestions: Microwave the tamarind for couple of seconds if necessary to ease the grinding process. Adjust tamarind and red chiles according to your preference. Variations: Check other recipes at http://talimpu.com/browse. Other Names: Garlic Spice Mixture, Velluli Pappula Karam. Makes: around 3/4 Cup of Spicy Toor Dal Powder. Heat a heavy bottomed pan on low heat, add toor dal and roast until the dal turns light golden in color. Remove the toor dal onto a plate. Add few drops of oil in the same pan, add broken red chillies. Fry for few seconds until red chillies change color and turn crisp. Remove the red chillies from heat. Add cumin seeds, black peppercorns, curry leaves and asafoetida and fry for few more seconds and remove from heat. Grind all the ingredients into somewhat coarse powder using a spice grinder. 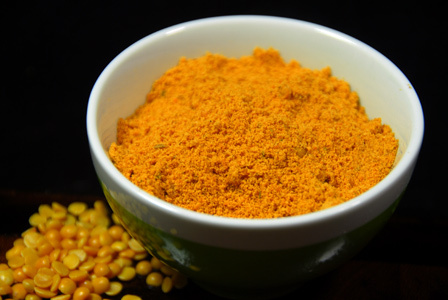 Store spicy toor dal powder in a tight jar and it stores fresh for months. Notes: Make sure not to burn the toor dal while roasting. Suggestions: Adjust spice with red chillies. Variations: You an also check other spice powders here. Other Names: Spicy Toor Dal Powder, Kandi Podem.